In Montgomery County, Pennsylvania, in the 1920s, a team led by Harold F. Pitcairn developed the first rotary-wing aircraft in the United States to receive type certification, an endorsement of a craft’s airworthiness. Pitcairn, youngest son of Pittsburgh Plate Glass Company founder John Pitcairn Jr., grew up an aviation enthusiast on the family estate Cairnwood in Bryn Athyn, Montgomery County. Soon after attending the Curtiss Flying School in Newport News, Virginia, he launched an airmail delivery service, Pitcairn Aviation, in 1925. The following year he purchased a field near Willow Grove in Horsham Township, Montgomery County, and built Pitcairn Field. The Pitcairn PCA-2, shown here in 1961, earned Pitcairn and his team the 1930 Collier Trophy, an annual aviation award administered by the U.S. National Aeronautic Association. Here, Eastern Airlines’ Kellett KD-1 Autogiro is shown taking off from the roof of the Philadelphia’s Post Office at Thirtieth and Market Streets in 1939. The Philadelphia area ascended in the realm of rotary-wing innovation through the work of Edward Burke Wilford Jr., who acquired U.S. patent rights for a rotary-wing aircraft conceived by German engineers Walter Reiseler and Walter Kreiser in 1929. Wilford purchased the Twin Brook Farm in Paoli, Pennsylvania, and transformed it into the Philadelphia-Main Line Airport. From there, Wilford’s “WRK” gyroplane, named from the initials of Wilford, Reiseler, and Kreiser, took flight in 1931. 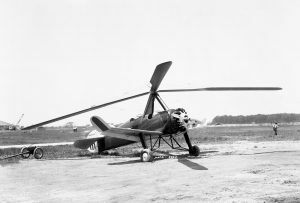 It was the first aircraft in the world to successfully use a rigid rotor design with cyclic pitch variation, which enabled the operator to balance lift by altering the pitch of the spinning blades. 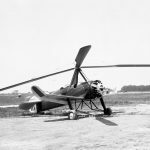 As Wilford relocated his operation to Essington, a much larger field that served as a training center and seaplane base during the First World War, brothers William Wallace and Rod Kellett, based in Upper Darby, Pennsylvania., achieved flight in 1934 with their KD-1 Autogiro. William, a 1913 graduate of Princeton University, served with the American Ambulance Field Service before becoming a decorated pilot in the French Air Force during World War I. He entered the aircraft manufacturing business in 1919, served as president of the Aero Club of Pennsylvania (1923-25), and established the Kellett Autogiro Corporation of Philadelphia with his brother in 1929. The U.S. Army Air Corps purchased the Kellett’s KD-1, and Eastern Airlines used it to deliver mail from Philadelphia’s Thirtieth Street Post Office to the Central New Jersey Airport in Camden. This constituted the first Autogiro used by the U.S. Postal Service to carry mail. Another Autogiro produced by the Kellett brothers, the K-3, accompanied Rear Admiral Richard E. Byrd to the Antarctic in 1933 and became the first rotary-wing aircraft to fly there. 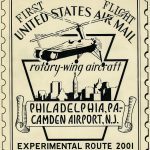 On July 6, 1939, the postal service began using an Autogiro aircraft to fly mail between the Central Airport at Camden, New Jersey, to the roof of the main Philadelphia post office. On the first day of service, 52,128 first-flight covers were canceled and carried on the flight for philatelists, many of whom paid double the six-cent stamp price to cover postage for a round trip. The Post Office Department made over $3,000 in revenue from the flights. The Autogiros were put to use flying airmail in Chicago, New Orleans, Los Angeles, and Washington, D.C., through the 1930s and into the 1940s. The Autogiro service was eclipsed and ended by the advent of helicopter airmail service. The Piasecki Helicopter Corporation, founded by Frank N. Piasecki, began producing HRP-1 helicopters in 1946 for the U.S. Navy at its facility in Morton, Pennsylvania. Renamed the Vertol Corporation in 1956, then acquired by Boeing in 1960 and relocated to Ridley Park, the operation produced hundreds of military and commercial CH-46 variants and over one thousand Chinooks. 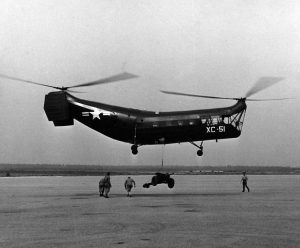 The Piasecki Aircraft Corporation, formed by Piasecki in 1955 and located in Essington, produced the world’s first shaft-driven compound helicopter, the 16H-1 Pathfinder, for the U.S. Army in 1962. A Piasecki HRP-1 Helicopter is shown here on September 8, 1948, at the Naval Air Station in Lakehurst, New Jersey, experimenting with the lifting of artillery equipment for the United States Army. In 1983, Boeing partnered with Bell to build the V-22 Osprey, a combat aircraft using tiltrotor technology to combine the vertical performance of a helicopter with the speed and range of a fixed-wing aircraft. Such complexity, fabricating an aircraft able to take off, hover and land like a helicopter and then convert into a turboprop plane capable of flying at high speeds and altitudes, required years of development. Production began in 1988, with about one-third of Boeing’s workforce at its plant in Ridley, Pennsylvania, building the fuselage, empennage and all subsystems, digital avionics and fly-by-wire flight control systems. The remainder of the aircraft’s construction, including final assembly, occurred at Bell Helicopter Textron Inc.’s facility in Amarillo, Texas. The U.S. Marine Corps finally fielded the Osprey in 2007 with the Air Force joining two years later. Their embrace of the aircraft brought criticism, including a report in Time magazine in 2007 that labeled the Osprey as unsafe and overpriced. By 2016, two hundred Osprey had been deployed at a cost of $72.1 million each. By that same year, testing the aircraft had claimed thirty lives and six more people had died while operating it, including three service personnel and one civilian killed in a crash on April 8, 2010, in Afghanistan. In total, Ospreys deployed to Afghanistan surpassed one hundred thousand flight hours, including the mission that led to the death of Osama bin Laden. 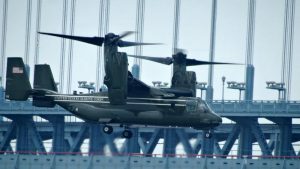 The rotary-wing aviation industry remained active in the Philadelphia region in the twenty-first century, although in some cases under control of outside firms. In 2005, Connecticut-based Sikorsky Aircraft Corporation acquired the Keystone Helicopter Corporation, a firm founded in Malvern in 1953, and expanded its operations at the Chester County Airport near Coatesville. In 2015, AugustaWestland, an arm of the Italy-based Finmeccanica industrial group, announced its intentions to produce its new AW609 tilt-rotor, a civilian aircraft comparable to the military Osprey, at its plant employing nearly six hundred people in Northeast Philadelphia. In 1982, the Italian helicopter builder Agusta opened a manufacturing and repair facility directly north of Northeast Philadelphia Airport. 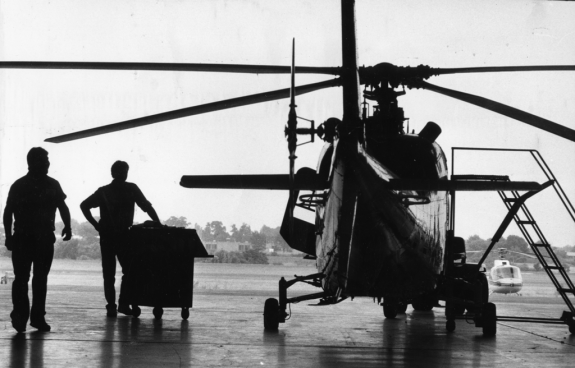 Agusta technicians built a variety of helicopters for American clients, who could then take test or training flights on the Northeast airfield. This 1988 photograph shows Agusta technicians repairing a civilian variant of Agusta's popular A109 helicopter, the A109 Mk. II. After Agusta merged with British helicopter manufacturer Westland in 2000, the company expanded its Philadelphia facility to produce more helicopters annually and made it the company's U.S. headquarters in 2005. The First Air Mail Flight from the roof of the Post Office @ 30th Street in Phila PA to Camden NJ. 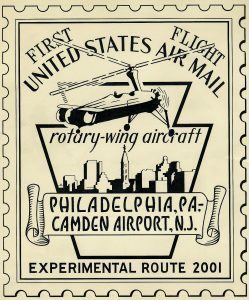 From barns and airfields throughout the Delaware Valley, during the twentieth century innovative individuals and local companies made greater Philadelphia the nation’s cradle of rotary-wing aviation. 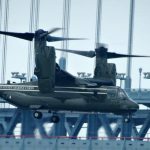 They successfully launched autogiros, gyroplanes, and helicopters, and the Boeing Company paired with Bell Helicopters in Buffalo, New York, to produce the world’s first production tilt-rotor aircraft, the V-22 Osprey. Well into the twenty-first century, the region remained the industry’s incubator for ideas. Notions of vertical flight derived initially from ancient China, where children played with bamboo flying toys that achieved lift when released. These Chinese “tops” inspired western scientists, including nineteenth-century French aviation pioneer Alphonse Pénaud (1850-80). Pénaud’s fellow countryman, Viscomte Gustave de Ponton d’Amecourt (1825-88) created the word “helicopter” to describe the model he built in 1863. Although d’Amecourt’s contraption remained grounded, its steam-powered engine too heavy for flight, Pénaud produced a successful model helicopter in 1870. Toy helicopters made by Pénaud sparked interest in flight for the Wright brothers Wilbur (1867-1912) and Orville (1871-1948), among others. Philadelphia emerged as a center for helicopter development because of its key location in the national airmail system developed during World War I. Army officials concluded that flying the mail would train a reserve of military aviators. They chose the short inaugural route between Washington, D.C., and New York, with a stop in Northeast Philadelphia at an airfield established along the Lincoln Highway in Bustleton. During the war, the military also based the Second Aero Squadron in Philadelphia, investing $250,000 to build a base at Essington, the site previously used by the Philadelphia Aviation School. 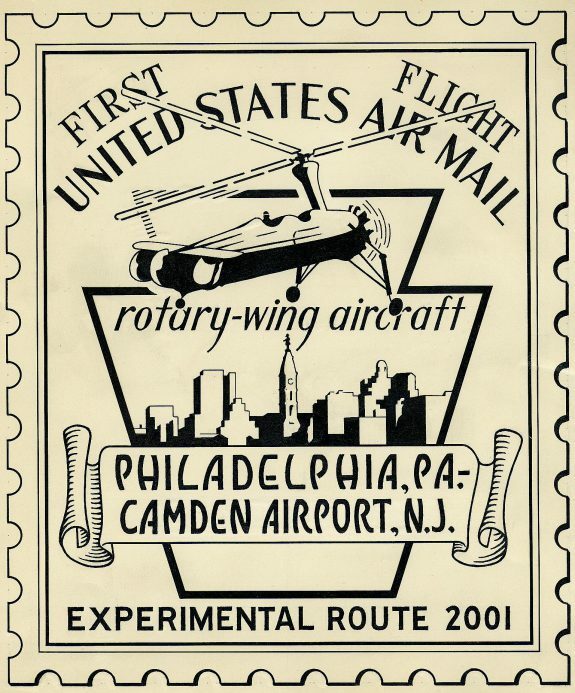 A young generation of Philadelphians, largely sons of wealthy industrialists who trained as engineers in the region’s universities, took inspiration from rotary-wing developments in Europe and perceived vertical lift as more efficient and safer than airplanes for delivering mail. In Montgomery County in the 1920s, a team led by Harold F. Pitcairn (1897-60) developed the first rotary-wing aircraft in the United States to receive type certification, an endorsement of a craft’s airworthiness. Pitcairn, youngest son of Pittsburgh Plate Glass Company founder John Pitcairn Jr. (1841-1916), grew up an aviation enthusiast on the family estate Cairnwood in Bryn Athyn, Montgomery County. Soon after attending the Curtiss Flying School in Newport News, Virginia, he launched an airmail delivery service, Pitcairn Aviation in 1925. The following year he purchased a field near Willow Grove in Horsham Township, Montgomery County, and built Pitcairn Field. The Pitcairn PCA-2, which gained type certification, also earned Pitcairn and his team the 1930 Collier Trophy, an annual aviation award administered by the U.S. National Aeronautic Association. When they traveled to Washington in 1931 to receive the award, a PCA-2 Autogiro piloted by James G. “Jim” Ray (1896-66) became the first rotary-wing craft to land at the White House. The Philadelphia area continued to ascend in the realm of rotary-wing innovation through the work of Edward Burke Wilford Jr. (1901-83), who acquired U.S. patent rights for a rotary-wing aircraft conceived by German engineers Walter Reiseler (1890-1938) and Walter Kreiser (1898-58) in 1929. Wilford earlier evidenced an interest in invention while working in his family’s dental-equipment firm, where he helped create a motorized dental chair. When his family sold the company, Wilford, a 1922 engineering graduate of the University of Pennsylvania, looked to the skies, taking inspiration from the solo nonstop flight from New York to Paris by Charles Lindbergh (1902-74) in 1927. Wilford purchased the Twin Brook Farm in Paoli, Pennsylvania, and transformed it into the Philadelphia-Main Line Airport. From there, Wilford’s “WRK” gyroplane, named from the initials of Wilford, Reiseler, and Kreiser, took flight in 1931. It was the first aircraft in the world to successfully use a rigid rotor design with cyclic pitch variation, which enabled the operator to balance lift by altering the pitch of the spinning blades. As Wilford relocated his operation to Essington, a much larger field that served as a training center and seaplane base during the First World War, brothers William Wallace (1891-1951) and Rod (1898-1963) Kellett, based in Upper Darby, Pennsylvania., achieved flight in 1934 with their KD-1 Autogiro. William, a 1913 graduate of Princeton University, served with the American Ambulance Field Service before becoming a decorated pilot in the French Air Force during World War I. He entered the aircraft manufacturing business in 1919, served as president of the Aero Club of Pennsylvania (1923-25), and established the Kellett Autogiro Corporation of Philadelphia with his brother in 1929. The U.S. Army Air Corps purchased the Kelletts’ KD-1, and Eastern Airlines used it to deliver mail from Philadelphia’s Thirtieth Street Post Office to the Central New Jersey Airport in Camden. This constituted the first Autogiro used by the United States Postal Service to carry mail. Another Autogiro produced by the Kellett brothers, the K-3, accompanied Rear Admiral Richard E. Byrd (1888-1957) to the Antarctic in 1933 and became the first rotary-wing aircraft to fly there. Meanwhile, Arthur M. Young (1905-95) experimented with helicopter design in a small aeronautical laboratory on his family’s estate in Radnor, Pennsylvania. Young’s parents, Eliza Coxe (1875-1950) and Philadelphia landscape artist Charles Morris Young (1869-1964), encouraged their son’s intellectual curiosity from an early age. They lent him the use of their barn for twelve years following the conclusion of his studies in mathematics and engineering at Princeton University in 1927. There, Young produced a variety of models, powered by everything from rubber bands to electric motors. Focused on the problem of stability, Young devised a stabilizer bar that linked directly to the rotor to enable control of the rotor plane independent of the mast. He demonstrated his invention to the Bell Aircraft Company in Buffalo, New York, on September 3, 1941. 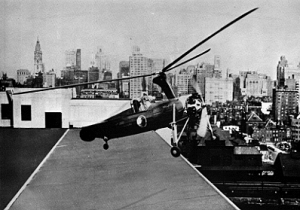 The result, Bell Model 30, became the fourth successful helicopter in the world. Christened as Genevieve, Young’s helicopter made its first untethered flight on June 26, 1943. His design became the signature rotor system for Bell helicopters into the 1980s. Helicopter development accelerated in the region and nationally during the late 1930s and early 1940s. At the federal level, as the Second World War stirred in Europe, the Dorsey-Logan Act (1938) provided funding to develop rotary-wing craft for the U.S. War Department. Also in 1938, the Franklin Institute (222 N. Twentieth Street) hosted the First Annual Rotating Wing Aircraft Meeting, sponsored by the Philadelphia Chapter of the Institute of Aeronautical Sciences. The initiative led to the formation of the American Helicopter Society (1943), which held its first four annual forums in Philadelphia (1945-48). Demand for helicopters increased with U.S. involvement in World War II and the subsequent Cold War. Locally, the Piasecki Helicopter Corporation, founded by Frank N. Piasecki (1919-2008), began producing HRP-1 helicopters in 1946 for the U.S. Navy at its facility in Morton, Pennsylvania. Renamed the Vertol Corporation in 1956, then acquired by Boeing in 1960 and relocated to Ridley Park, the operation produced hundreds of military and commercial CH-46 variants and over one thousand Chinooks. The Piasecki Aircraft Corporation, formed by Piasecki in 1955 and located in Essington, produced the world’s first shaft-driven compound helicopter, the 16H-1 Pathfinder, for the U.S. Army in 1962. The U.S. Marine Corps finally fielded the Osprey in 2007 with the Air Force joining two years later. This prompted criticism, including a report in Time magazine in 2007, that labeled the Osprey as unsafe and overpriced. By 2016, two hundred Osprey had been deployed at a cost of $72.1 million each. By that same year, testing the aircraft had claimed thirty lives and six more people had died while operating it, including three service personnel and one civilian killed in a crash on April 8, 2010, in Afghanistan. In total, Ospreys deployed to Afghanistan surpassed one hundred thousand flight hours, including the mission that led to the death of Osama bin Laden. To preserve the history of the pioneers of the modern helicopter industry, the American Helicopter Museum and Education Center opened in West Chester, Pennsylvania, in 1996. This resulted largely from the efforts of Peter Wright (1917-2000), a highly decorated combat aviator from World War II’s “Flying Tigers” and founder of the Keystone Helicopter Corporation. The museum’s exhibits and programs make evident the Greater Philadelphia area’s central place in the ongoing evolution of rotary-wing flight. Robert J. Kodosky is an Associate Professor of History at West Chester University. He is the author of Psychological Operations American Style: The Joint United States Public Affairs Office, Vietnam and Beyond. Anderson, R.G. 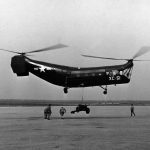 History of Rotary Wing in the United States. Bridgeport, Conn.: American Helicopter Society, 1944. Boulet, Jean. 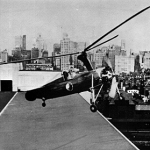 History of the Helicopter: As Told by its Pioneers, 1907-1956. Paris: Editions France-Empire, 1984. 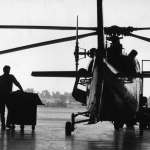 McGowen, Stanley S. Helicopters: An Illustrated History of their Impact. Santa Barbara, Denver and Oxford: ABC CLIO 2005. McGuire, Francis G. Helicopters 1948-1998: A Contemporary History. Alexandria, Va.: Helicopter Association International, 1998. Spenser, Jay P. Whirlybirds: A History of U.S. Helicopter Pioneers. Seattle: University of Washington Press, 1998. Trimble, William F. High Frontier: A History of Aeronautics in Pennsylvania. Pittsburgh: University of Pittsburgh Press, 1982. American Helicopter Museum and Education Center, “Primer on Rotary Wing History of the Delaware Valley,” undated. E. Burke Wilford Aviation Collection, Special Collections, West Chester University, West Chester, Pa.
American Helicopter Museum and Education Center, 1220 American Boulevard, West Chester, Pa.
Wings of Freedom Aviation Museum, Route 611, Horsham, Pa. Thanks, Mr. Kodosky. I’ve always loved the 1930s photos of autogiros over Center City that I came across and thoroughly enjoyed learning more about their development right here!